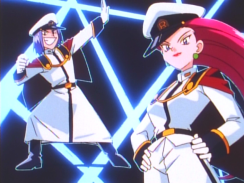 "The Rocket-Dan Forever" (ロケット団よ永遠に) is a Rocket-Dan image song written by the trio's creator Shudou Takeshi and serves as the one of their main theme songs. It was later used as the opening theme to Pokemon Radio Show! The Rocket-Dan's Secret Empire radio show. Used in episodes Original Series Episodes 045 ("Sing! Purin! "), 072 ("Nyasu's A E I O U"), and 245 ("The Twin Pupurin vs. Purin! The Singing Pokemon Concert! "), Side Story "The Rocket-Dan! Love and the Origin of Youth," BW 097 "The Reijuu Formes Advance! Isshu's Greatest Crisis!!" and BW 109 "The Araragi Laboratory! A New Journey!!" Musashi! Kojirou! Nyaasu de nyaasu! Is love the same as justice? Is justice the same as evil? Are dreams the same as reality? Reality is the same as nightmares. We'll get around to being the stars someday! But let's do it anyway? Alright! This is being made into a CD! We can't calculate how major this is. 1) The "aru" in ashita ga aru is, of course, the Japanese way of saying the word "is." But! It also sounds very much like the Japanese pronunciation of the letter R, as in the first letter of the word "Rocket." This may or may not be a coincidence. Back to the lyrics. 2) In the line Aasu wa chikyuu, "aasu" is the way the Japanese people say the English word "earth." It also sounds very similar to both Nyasu's name (Nyaasu) and the word "nice" (naasu), so the second line here (Chikyuu wa Nyaasu) is a play on that. You may remember that a similar pun was made about Dogas' name in the fourteenth episode of the original series. The third line (Nasu taberu nara, maaboo Nyaasu) plays with the fact that Nyasu's name also sounds like the Japanese word for eggplant, "nasu." "Mapo nasu" (usually written out as 麻婆茄子 or マーボー茄子) is a spicy dish that uses eggplants as one of its staples. Back to the lyrics. 3) Musashi and Kojirou are counting up to seven here (Turning one, two, three times is a good feeling; Gradually adding four, five, six points is a good feeling). Once they get to seven, they say shichiten battou (七転八倒), a phrase that means "to writhe in agony." Y'know, like what they do whenever they're defeated by Satoshi and his friends. In this song, the battou part of that is written in katakana and is followed by other onomatopoeia words, so I decided to translate the shichiten battou part as simply "we go Smash!" to convey the same idea of being in pain. Back to the lyrics. 4) Miyamoto Musashi and Sasaki Kojirou, the two samurai who the Rocket-Dan's Musashi and Kojirou are named after, had their famous duel in the Kanmon Straits between Moji (on the Kyushu side) and Shimonoseki (on the Honshu side). These lines are a reference to that battle. Back to the lyrics.